"@ICCLive : 3rd T20I. 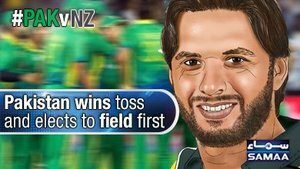 2.5: I Wasim to M Guptill, 4 runs, 36/0 bit.ly/nzvspak3 #NZvPak "
"Pakistan won the toss and elected to bowl first." Its a Six! That was really fantastic shot by Guptill. The BLACKCAPS and Pakistan are back in action and Guptill smashes a cover drive for four first ball.